Here is your "all-access pass" to fun in the sun! The William J. (Billy Joe) Rish Recreational Park was named in honor of former State Representative Billy Joe Rish. Mr. Rish was elected to the House of Representatives in 1970 and served the citizens of the State of Florida very well. He was a strong advocate for the development of a safe, outdoor recreational area for Florida’s disabled citizens. By his efforts, Florida Law 789-458 was signed by the Governor in June 1978, naming the park as “The William J. Rish Recreational Park.” Representative Rish demonstrated in his private life and personal actions, the same selfless concern and Christian love for those less fortunate than himself. He made a lasting impact for all individuals with disabilities, not only for Rish Park, but also in every other piece of legislation affecting those with disabilities. Representative Rish passed away in May 2008. He was a great friend to Sunland and will certainly be missed. The William J. 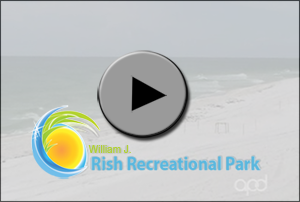 (Billy Joe) Rish Recreational Park is a 100-acre recreational park located on Cape San Blas near Port St. Joe in the Florida Panhandle. 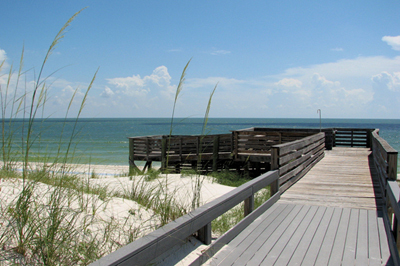 The park is a fabulous getaway with beautiful, sugar-white sand, sea oat covered dunes, refreshing sea air, and shimmering turquoise-blue water on the beautiful Gulf of Mexico. The uniqueness of Rish Park affords individuals with disabilities a safe beach experience that is completely ADA accessible. 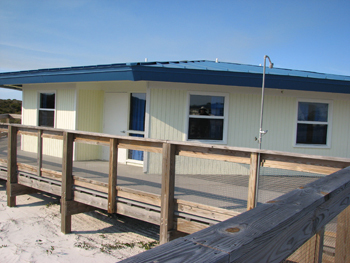 Rish Park has approximately two miles of boardwalks and ramps connected to spacious dormitories and family cottages. Amenities include a multipurpose event hall with a complete cooking facility and an Olympic-size swimming pool. You can cool off from a day of sunbathing or have some fun in the company of friends. Journey to the shore and stroll along the piers extending over St. Joseph Bay for a close-up look at shore birds flying overhead and the coastal wildlife in its natural habitat. You cannot get any closer to nature than Billy Joe Rish Park! 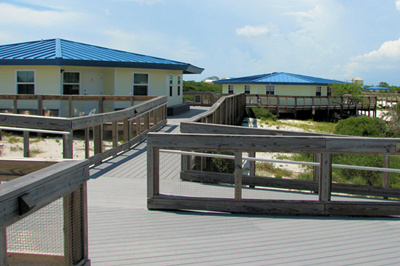 Reservations: Florida residents with disabilities may rent cottages and dormitories or use the park facilities. Family members or guardians accompanying individuals with disabilities are welcome, as are state or private caregivers who transport and assist them. The park is open 12 months a year. Summer months are peak times and advance registration is recommended. For information about the Park, you can contact Rish Park at (850) 227-1876 or (850) 247-8214. To download the reservation form or obtain updates Click Here, or you can call (850) 482-9386 between 8 a.m. and 4:30 p.m. Central time, Monday through Friday. To see the beauty of Rish Park, click on this five-minute video. You will learn about the interesting history, current recreational opportunities, and plans for future enhancements of Rish Park.